Basket quilt, made from Reproduction Style fabrics. All Cotton, with cotton batting. Machine pieced and Machine quilted. 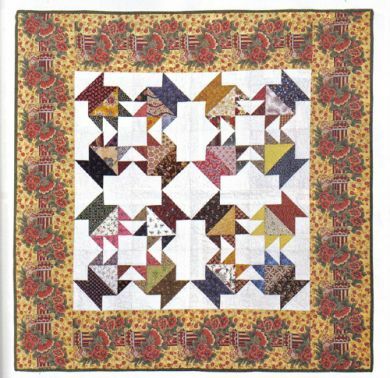 Quilted in the ditch of the baskets blocks, with a Fleur de lis pattern in the open spaces, and the design of the border outlined. This quilt has appeared in Australian Patchwork and Quilting magazine.